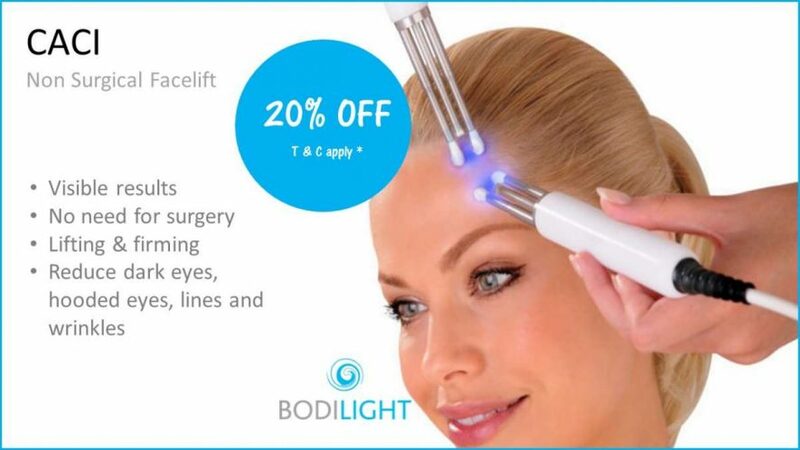 Bodilight are very excited to offer the award winning CACI (Computer Aided Cosmetology Instrument). It has gained the reputation of being the best micro machine in the beauty industry. It is also considered the most advanced multifunctional face toning treatment of its kind. Recently voted number 1 anti-aging treatment on 10 years younger TV show. CACI works differently for different people. The change to someone in their 20s would be more subtle than someone in their 50s who would see more dramatic changes. If you want to regain the bounce of your youth and need help with developing fine lines, then CACI will help. Even in our twenties fine lines can start to appear. CACI is used by celebrities making it hugely publicised in beauty media. CACI offers an alternative to surgery for both men and women wanting high precision with visible results. The treatment gently lifts, tightens and tones facial muscles whilst smoothing fine lines and wrinkles. Your skin will feel wonderfully hydrated, firmer, plumper and you will have a more supple appearance. Dramatic results in just an hour. Progressive results are achieved with every treatment and a course of 10 is recommended for optimum results. A top up is recommended every couple of months. CACI uses a unique combination of specific micro-currents, working in harmony with your body’s own bio-electrical field, to stimulate the muscles in your face to gently lift and tighten preventing the skin from sagging. Almost like a workout for your face. A therapist will run cotton prongs over your skin targeting muscles to manipulate and train them. There are several options available comprising of microdermabrasion, ultrasonic peeling and CACI wrinkle revolutionary comb. All catering for different target areas and needs. For example, you might want to target hooded eyes or puffy, dark circles in which case the CACI eye revive treatment is recommended to lift, smooth, plump and hydrate leaving your eyes looking bright and smoothed. There is also the Jowl lift specifically developed to target muscle laxity around the jawline. The Quad probes will lift and firm the muscles to refine the facial contours. They say your hands always give away how old you are! Well with the CACI hand treatment a course will make your hands look and feel great helping to disguise that annoying giveaway. There is even an electro-cellulite massager designed to contour legs and buttocks. The massager roller breaks down fatty deposits, flushing toxins away, smoothing dimples and giving the skin a smoother, tighter appearance. Perfect for getting your body bikini ready before a holiday. All in just a 30 minute session. The colour touch screen interface can provide you with a vast selection of over 40 pre-set treatment programmes designed to soften lines and wrinkles, tone the face, rejuvenate the hands, reduce the appearance of stretch marks and improve acne and blemishes. There is no cure for aging, but we can certainly help reduce the appearance of it with CACI the most effective anti-aging treatment available. Due to its dramatic results, it is often referred to as “The non-surgical face lift”. Please see the Bodilight website for a description of all our treatments and prices. Buy any 10 treatments and receive 20% off. All treatments are tailored to suit your individual needs and will be discussed with the therapist first. Please call for a no obligation free consultation.